Wandle Software Limited is pleased to announce our new app for iPhone and iPad, ShareEverywhere. Made possible by the new sharing functionality in iOS 8, ShareEverywhere adds itself to every standard “action” menu, allowing you to share links and images to a wide range of services. 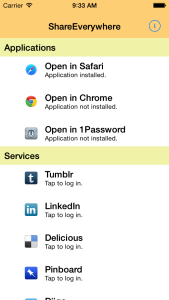 Previously sharing a link from an iOS app to another service was painful. To share a link from Safari you had to either configure a “bookmarklet,” which was convoluted and difficult, or copy the link to the clipboard and manually launch a sharing app, which was clunky. ShareEverywhere will be available worldwide on the App Store from 17 September 2014, subject to approval by Apple. It supports both iPad and iPhone, including the new screen sizes recently announced and will be available for $1.99, £1.49, €1.79 or your local equivalent.